A sea lion attacked and dragged a young girl into the waters at the Steveston Fisherman's Wharf, Richmond B.C. Canada. The girl was rescued and uninjured. The family of the Canadian girl, who was dragged into the water by a sea lion over the weekend and is being treated for a related infection, is speaking out for the first time. 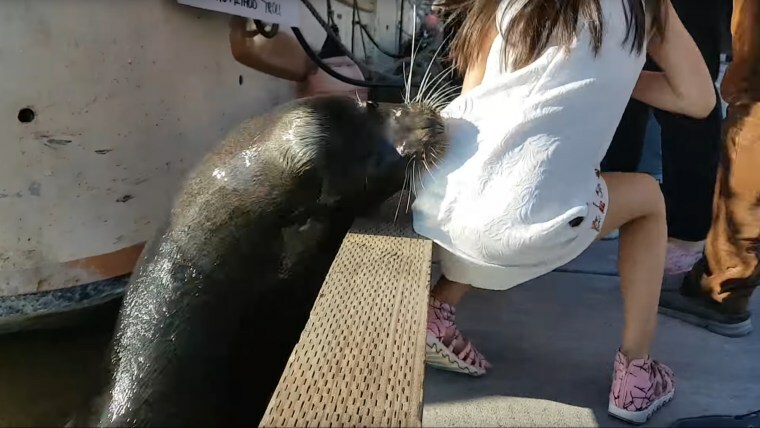 Dramatic video of the sea lion grabbing the girl’s dress and pulling her into the sea as she sat on a Richmond, British Columbia, pier on Saturday quickly went viral. An older man who appeared to be a relative jumped into the water and quickly rescued her. The girl's father credits the older relative's quick-thinking with saving her life. "If he had one- or two-second doubt about that, my girl could have been gone by then. That reaction, makes him a hero," the girl's father said in an interview with the Canadian Broadcasting Corporation. Days later, the Vancouver Aquarium urged the girl’s family to get her help because she was possibly in danger of a hazardous infection known as "seal finger." “The family saw media reports in which our marine mammal trainer recommended they call us, and they did get in touch." Vancouver Aquarium spokeswoman Deana Lancaster told NBC News. "She did get a superficial wound and she’s going to get the right treatment." While some have blamed the ordeal on the girl's parents, and claims have been made that they were feeding the sea lion, the family denies the accusations. "There was somebody beside them that was trying to feed them. Also, they weren’t trying to take pictures or anything," the father said. A bite from a seal or a sea lion is quite different from that of a terrestrial animal because it carries a host of bacteria uncommon to land mammals, experts say. "Seal finger" can be caused by bacteria called Mycoplasma phocacerebrale, which must be treated promptly with tetracycline antibiotics, Canadian researchers reported in 2009. Seal finger causes the affected area to swell up and look like it is practically inflated. It tends to affect the hands because that is where seal trainers, sealers, vets and biologists are wont to be nipped by the animal — although it can also come from cuts on the hand while working with seal meat. "If any member of our animal care team receives a bite from a sea or sea lion, they take a letter from our vet with them to the hospital, which explains that the infection is resistant to some antibiotics,” Lancaster said. While it is more easily treated now, sealers historically lost their fingers or even their hands sometimes because of the disease. As the young girl receives treatment for the bite wound, her father said he is happy she is safe and has learned a lesson. "Only thing I care is God, she is safe. I could have gone organizing a funeral by now rather than doing interview," he said.